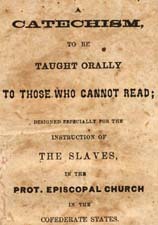 Protestant Episcopal Church in the Confederate States of America A Catechism to Be Taught Orally To Those Who Cannot Read; Designed Especially for the Instruction of the Slaves. African Americans -- Confederate States of America -- Religion. African Americans -- Southern States -- Religion. Episcopal Church -- Catechisms -- English. Protestant Episcopal Church in the Confederate States of America -- Catechisms -- English. Race relations -- Religious aspects -- Episcopal Church. Slavery and the church -- Episcopal Church. Slaves -- Religious life -- Confederate States of America -- History -- 19th century. Slaves -- Religious life -- Southern States -- History -- 19th century.